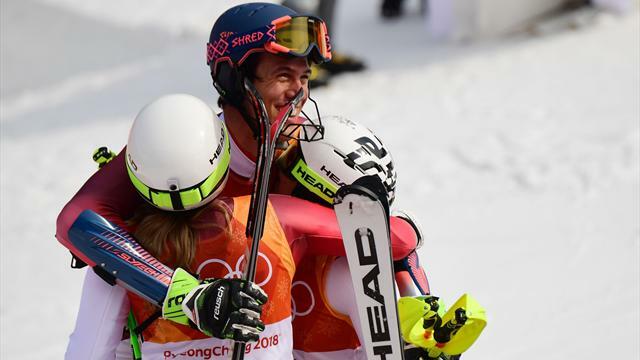 Switzerland took the inaugural Olympic gold in the Alpine team event after beating rivals Austria 3-1 in the final, with Norway claiming bronze ahead of world champions France. Austria eased past Norway 3-1 to reach the big final, while the Swiss soon joined them after they prevailed 3-1 against France. And after a 2-2 draw saw Norway edge France on a tie-break – thanks to a quicker combined time of 0.21 seconds – the nation celebrated its 38th medal of the Games, seeing them surpass the US' record medal-haul (37 at Vancouver 2010) at a Winter Olympics. Austria led 1-0 when Katharina Liensberger beat Denise Feierabend, but the Swiss were back level when Ramon Zenhaeusern (slalom silver medallist in Pyeong chang) bested Michael Matt (bronze silver medallist). Wendy Holdener’s victory over Katharina Gallhuber then put Switzerland on the brink of victory, and that was confirmed when Marco Schwarz stumbled when racing against Daniel Yule. Meanwhile, Team GB’s team - Charlie Guest, Alex Tilley, Dave Ryding and Laurie Taylor - narrowly missed out to Norway by 0.21 seconds in their quarter-final encounter, having originally tied the clash 2-2.